Have you tried out Java 8 yet? The official release is not until March 2014 but there have been a set of release candidates to play with. It is actually very easy to get up and running. Download a JDK 8 snapshot from https://jdk8.java.net/ and install it. Install a version of Eclipse that can handle Java 8 syntax. I downloaded Eclipse Luna 4.4 from http://downloads.efxclipse.org/eclipse-java8/2013-05-19/. 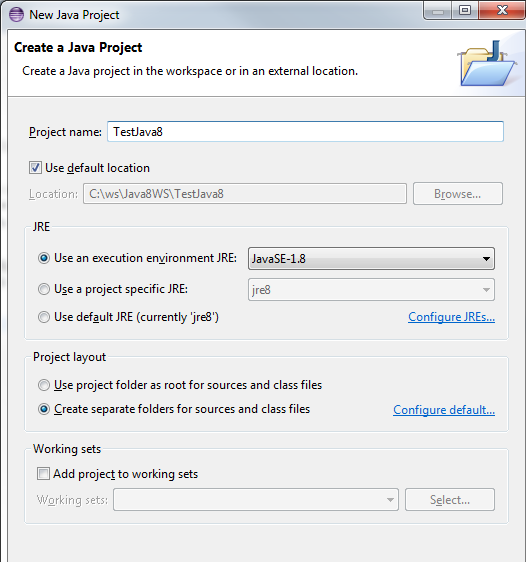 To get started, create a new project in Eclipse and make sure you have chosen the Java 8 JRE. Here's a class that uses a lambda expression to instantiate the functional interface PowerCalculator. A functional interface is an interface with only one abstract method. This outputs the expected "81". That was maybe not very cool, but when looking into the more functional style of programming you can do with lambda expressions, this is the most interesting Java upgrade since Java 5 in my opinion. I wrote an article in 2012 on FP in Java http://macgyverdev.blogspot.se/2012/10/functional-programming-in-java.html and took a quick look now again to see whether the original spec still is valid. The Eclipse support in Luna 4.4 is pretty good. But when using the command completition it is not obvious what the different lamda expression consumers expect. I guess once you have played around with it some more you get accustomed to the Predicate and Consumer APIs.